All of our surgeons perform the weight loss surgeries laparoscopically. It is minimally invasive-described as a "keyhole" surgery-with minimal pain. You will be given pain medication for any discomfort you may experience. Every attempt is made to control pain after surgery to make it possible for you to move about quickly and become active. This helps avoid problems and speeds recovery. Often several drugs are used together to help manage your post-surgery pain. Almost immediately after surgery your surgeon will require you to get up and move about. This aids in your recovery and prevents complications. This varies by procedure and surgeon but generally for the Gastric Sleeve & Gastric Bypass patients they will have a small tube to allow drainage of any accumulated fluids from the abdomen. This is a safety measure, and is usually removed a few days after the surgery (before your release from the hospital.) Generally, it produces no more than minor discomfort. Your hospital stay will depend on the type of weight loss surgery you have. Generally, hospital stays are between one and three days..
You should be able to return to work three to five days after surgery as long as you do not need to lift, push or pull anything over 15 lbs for the first three weeks after surgery. You may begin light exercise only one week after surgery, initially walking then gradually increasing exercise as you lose weight. Patients are encouraged to stop smoking at least one month before surgery. Smoking increases the risk of lung problems after surgery, can reduce the rate of healing, increases the rates of infection, and interferes with blood supply to the healing tissues. Some of our surgeons are very strict on this policy; you may also be sent home without surgery because of the risk involved. Is it possible to lose too much weight after Bariatric Surgery? Can I become pregnant after having Weight Loss Surgery? Other than the obvious high calorie foods, are there foods Weight Loss Surgery patients should avoid? 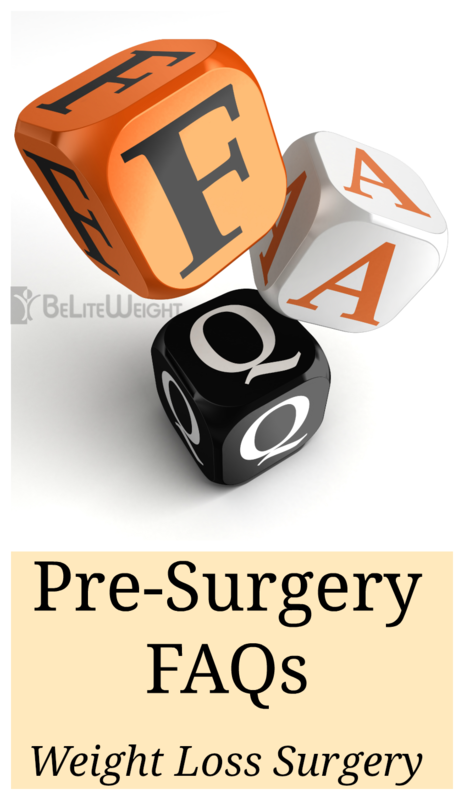 What are the risks/ complications associated with Weight Loss Surgery? What is done to minimize the risk vein thrombosis / pulmonary embolism (DVT/PE)? Because a DVT originates on the operating table, therapy begins before a patient goes to the operating room. All patients are treated with leg compression stockings and possibly in some cases they are given a blood thinner prior to surgery. The major preventive measure involves getting the patient moving and out of bed as soon as possible after the operation to restore normal blood flow in the legs.